It’s a great question! I have experienced the same struggle! It seems like so many of the books in this category didn’t seem worth reading. Feeling at a loss when my oldest hit this stage in her reading journey, I went to a trusted, wise friend who had older kids. I asked her what she gave to her kids to read in this phase, and she let me peruse the ‘easy chapter book’ section of her home library. I’m delighted to report that many books on her shelf are now on my list! I hope there are some on this list that your kids will enjoy too. This series is a perfect one for young readers because of the way the story draws you in and practically forces you to pay attention. Children are invited to follow the trail of boy detective, Encyclopedia Brown. My five year old thoroughly enjoyed listening to my seven year old read these aloud to her! They both followed the story and tried to pick up on the clues hoping to solve the mystery before the end. My kids have giggled and giggled as they have read the adventures of these tiny people called the ‘Littles’ who live in the walls of the ‘Biggs’ home. They find everything they need living with the Biggs and hope to repay them by making sure everything in the home is in good working order. The Biggs go out of town for the summer and a new family, the Newcombs, stay in their home. The Newcombs are messy and their mess attracts mice! This story is the adventure of the Littles finding a way out of this dilemma. The Littles is part of a series. Here are a couple others in the series we have enjoyed: The Littles and the Big Storm and The Littles and the Trash Tinies. Nate the Great is a great choice for a beginning reader because of it’s length: it is only about 60 pages. It includes illustrations on most pages, and does not have an overwhelming amount of words on each page. Nate is a boy detective who "likes to work alone" to track down the culprit and solve the mystery. Nate also loves pancakes which made him immediately relatable to my kids. Nate the Great is part of a series. Here are a couple others we have enjoyed: Nate the Great Goes Undercover and Nate the Great and the Phony Clue. My seven year old recently read Pioneer Cat out loud to me. He was so interested in finding out how the story would unfold that he didn’t want to put the book down. We begin by stepping into the story of a nine-year-old girl, Kate, who is traveling with her family by a wagon train from Missouri to Oregon. There are no cats allowed on the wagon train except a special one, Snuggs, who found his way to Kate’s wagon. She made a spot for Snuggs to stay while he joined them on this long and difficult journey. Stepping Stones has many great selections. I prefer the stories that are in the categories, ‘History’ or ‘Classics’. Here are a few titles we’ve enjoyed: Hannah, Next Spring an Oriole, Anna Maria’s Gift, Swiss Family Robinson, Anne of Green Gables, and The Secret Garden. 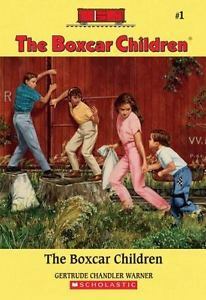 What child doesn’t find living in a boxcar to be exciting and intriguing? Our family has immensely enjoyed reading and re-reading this book over the years! The Alden children find themselves without caregivers and are determined to stay together. In their search for a home, they come upon a boxcar. As they begin to build a new life together, a turn events bring them together with extended family. An entire series of adventures with the Alden children follow this book. Here are a few we’ve read: Surprise Island #2, The Yellowhouse Mystery #3, Mystery Ranch #4. Please leave us a comment and let us know what easy chapter books you would add to this list.